On the far side of a beautiful mountain pass beyond the Tetons, sheltered between the much less-traveled Wind River Range and the wild Absarokas, the community of Dubois is an authentically rustic Old West town. 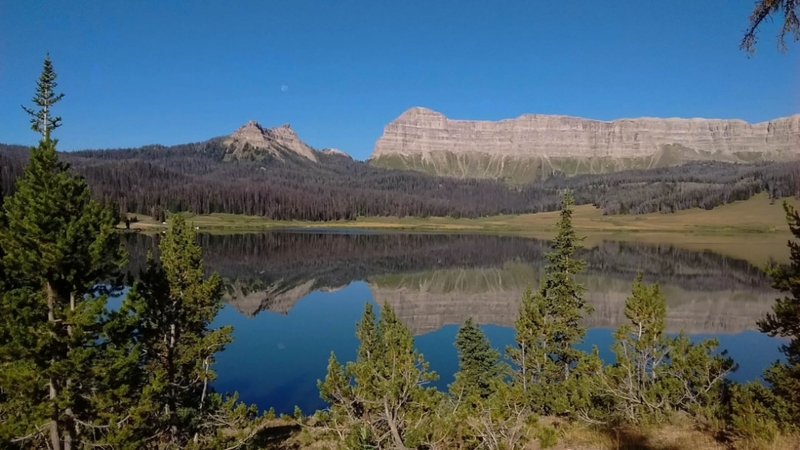 Small and unspoiled, but quirky, it’s surrounded by endless natural beauty with access to some of the most scenic sights along the Continental Divide. With Yellowstone National Park and the Wind River Indian Reservation about an hour in each direction, and many attractions nearby, Dubois is the ideal place to gain a new sense of balance and vitality, or to bring your family to adventures in a world full of discoveries that will be theirs alone. There’s no way to see everything the Dubois area has to offer in only five days. But the following itinerary will get you off the beaten path, to some of the best trails in the surrounding national parks, and around the Wind River Range. First things first: Find a place to stay. It’s just a matter of figuring out which spot suits you best. Located right in town, Twin Pines Lodge and Cabins is comfy and rustic, and you can stay in a room at the lodge or choose one of the spacious cabins, perfect for families. Or check out the Branding Iron Inn for another log-cabin experience. If you want something a bit fancier, the high-end, all-inclusive Brooks Lake Lodge will provide all the pampering you need—and you can stay in a log cabin here if you want too. There are also many cabins available for private rental. Finally, if you prefer to sleep under the stars, consider camping at a campground in town along the river or out near Brooks Lake for a perfect night out in nature. Once you get settled, it’s time to explore. 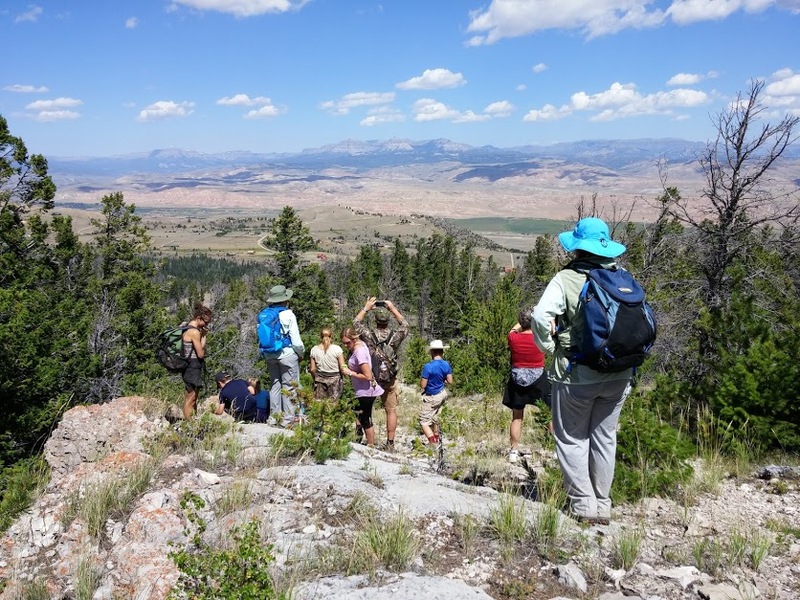 Surrounded by mountain ranges, the Dubois area is abundant with hikes full of beautiful views. Image: Bill Sincavage. If you want to start your day off on the right foot, a quick stop at Kathy’s Koffee will liven your spirits with and a strong cup of Joe and a delicious pastry. Want something a bit more substantial? Locals know that a great place for a breakfast sandwich is the kitchen at the back of Taylor Creek Exxon, on the west edge of town. To start your day, head over to Whiskey Basin. You’ll find hikes into glacial valleys full of lakes, sweeping mountain views, and waterfalls—just the tip of the iceberg for adventures in the region. The trails at Whiskey Basin are relatively uncrowded and extremely beautiful. Both Whiskey Mountain and Lake Louise have stunning views. 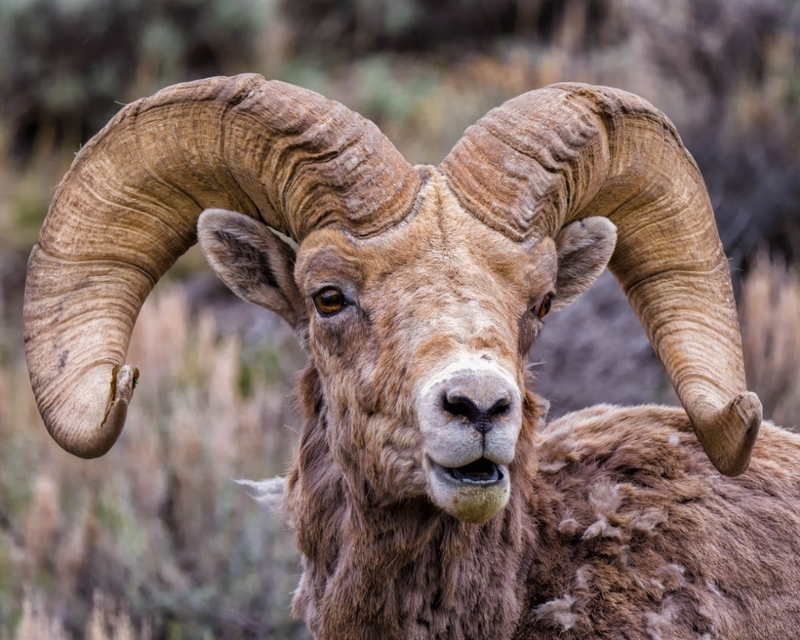 Afterwards, especially if you have children who love animals, stop by the National Bighorn Sheep Interpretive Center and learn all about the region’s signature creatures through exhibits, movies, and full-scale taxidermy mounts that replicate the habitat of bighorn sheep. If you’re visiting between November and March, you can join a five-hour tour that allows you to witness firsthand the world’s largest wintering herds of Rocky Mountain bighorn sheep. Afterwards, don’t forget to take your picture with the giant jackalope at the Exxon Country Store—no trip to Dubois is complete without it. As the day comes to a close, head to the Cowboy Cafe for a quick and tasty bite. Everything on the menu is good, but the Bubba is a steal. It’s a cheeseburger, fries, and slice of pie with ice cream for under $10. The staff is friendly and jovial, even on crowded summer days. Once dinner is done, don’t miss out on a beautiful sunset. Nowhere in town will you find better viewing than up on the ridges surrounding the mountain bike trails around Overlook Drive. From this vantage point above the town, you can watch as the sun sets in the distance, illuminates the hills, and turns everything different shades of purple, red, and orange. Since today will be a long day, skip the formal meal and grab a quick breakfast from your motel. If you do need something more substantial, swing by The Perch Coffee House, which opens at 6am. Fill up on a breakfast burrito or bagel, grab a coffee, and hit the road. The “Winds” and the Absarokas offer almost countless opportunities for great hikes, with a diversity of landscapes. Climb the switchbacks up to Union Pass west of town in your car, and set off on foot on one of the logging roads around the region or on the Continental Divide trail itself. A great hike is toward remote, placid Lake of the Woods. Or you can head north of town and head for the petrified forest trail that takes off from Double Cabin campground. There are also great long rambles along the base of the Ramshorn, the curved peak at the top of the Dunoir valley that the town has adopted as its symbol. For the truly ambitious, one of the best spots for hiking in the area is Cirque of the Towers. It’s a three-hour drive from Dubois and you’ll need to camp out to make the trip, but the 20-mile loop hike will reward you with views of stunning, craggy mountains rising in all directions— it’s what many call a mountaineer’s Disneyland. 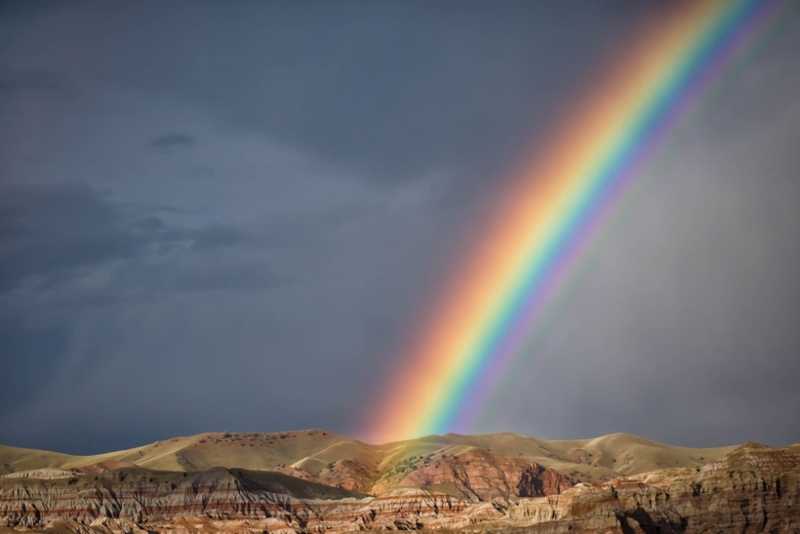 There may not be gold at the end of the many rainbows that arch over Dubois, but they all point to dreams. Image: Bill SincavageFor families looking to get outside, an easier option is to head up past the town landfill and explore the red-rock badlands on either side of the dirt road leading across Table Mountain. 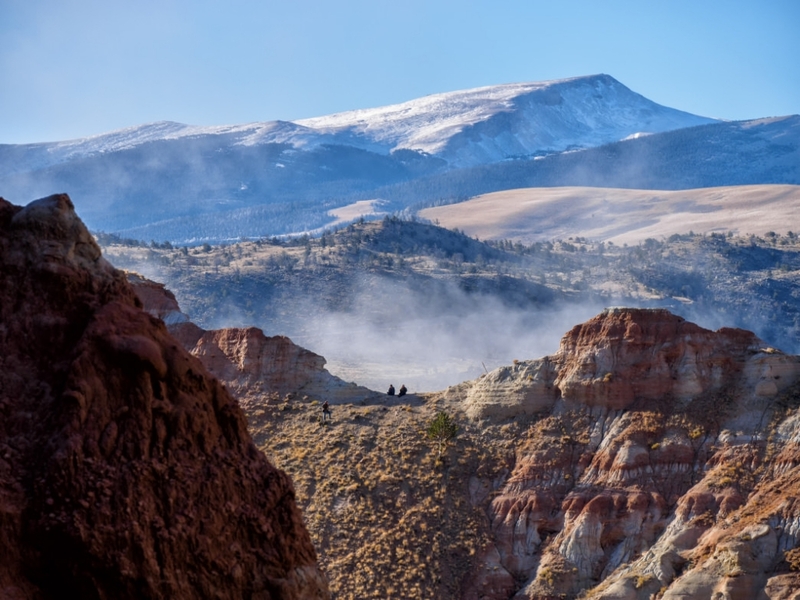 It’s the perfect place to explore the slickrock and hoodoos of the region. Stay for as long as you like, the scrambling and climbing will keep the kids entertained for hours, and you may find a buffalo bone or even a petrified rock along one of the countless draws. 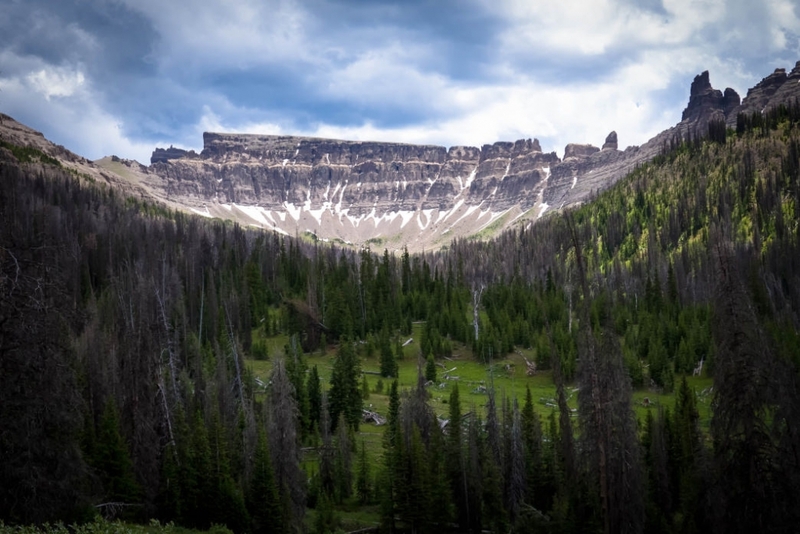 When you are finished here, be sure to drive along the Wind River Canyon Scenic Byway—no trip to this region of Wyoming is complete without it. 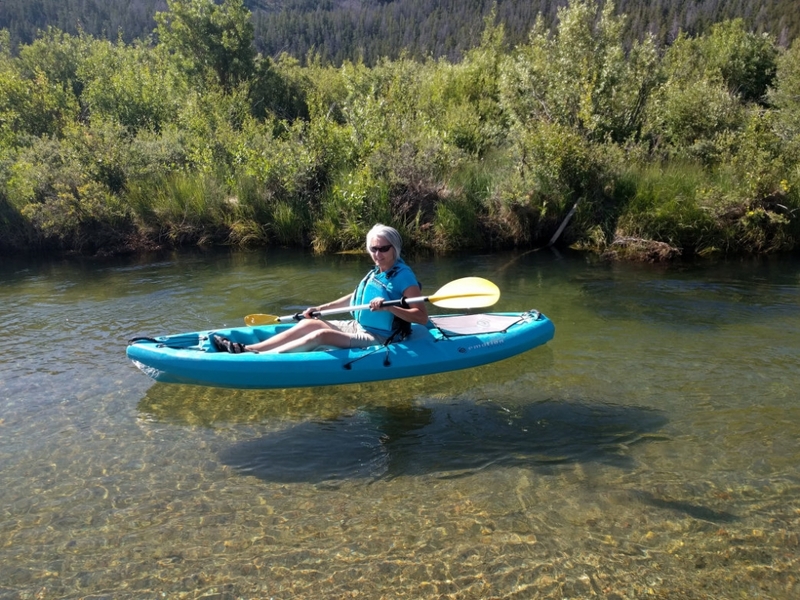 There are 2,000 rivers and streams and numerous lakes in the Wind River Valley, so why not spend your third day in Dubois exploring the local waters by boat? Start the day by grabbing some breakfast at the Village Cafe and Daylight Donuts in Dubois, and figuring out where you want to paddle. The Wind River flows right through town and makes for the perfect (and very convenient) spot for a relaxing float through the gorgeous scenery of the Wind River Range. Look for the “Wind River Access” signs along the river for good spots to put in. You can also head out to quieter lakes not far from town like the placid Trail Lake or Torrey Lake, but there are many other options as well. The outdoor shops right in Dubois can help gear you up with everything you need for your day. 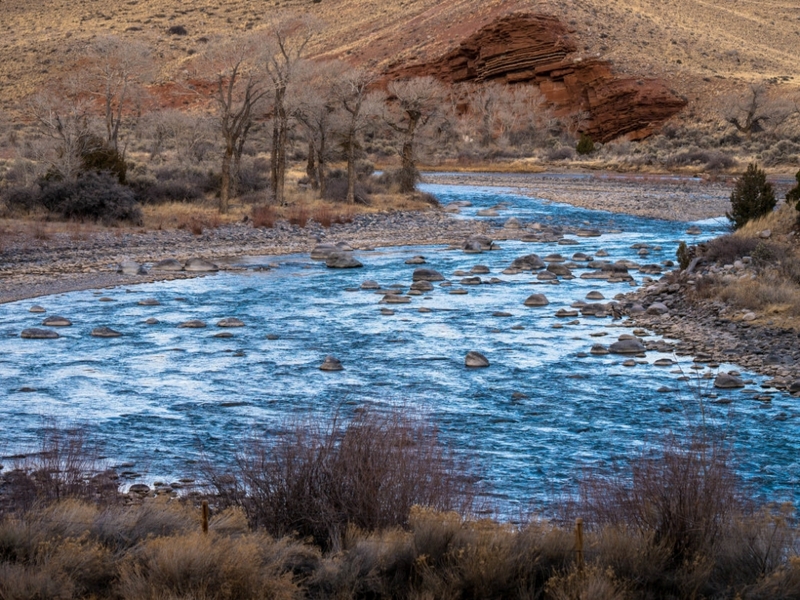 When you are done on the water, stop in at the Dubois Fish Hatchery, where they produce 500,000 fish annually, on average, for stocking Wyoming’s streams, ponds, and lakes. Tours of the hatchery are available daily from 8am-5pm year round. When the day is done, head out for some delicious pizza and a cold beer at Hooper’s. The friendly staff and local drafts will have you re-energized in no time. Take the time to have a leisurely breakfast at one of the breakfast spots in town. Since today’s adventure will bring you into the Shoshone National Forest, you’ll also want to plan snacks and lunch before you leave as most of your day will be spent away from amenities. You can pick up food at the Super Foods in Dubois or get a meal-to-go from the delicious Nostalgia Bistro. Today’s trek brings you to Brooks Lake. It’s about a 45-minute drive from Dubois, but the adventure begins the minute you leave the highway and head toward the lake. Rising up to the northeast, the Pinnacles act like a beacon for adventurers and wilderness lovers. The region is full of incredible hikes for all levels and the lake is a great destination to explore if you just want some fresh air. For families that hike, check out the seven-mile, round-trip trek up to Bonneville Pass. In the summer months, the region explodes with fields of wildflowers. For serious hikers, there are numerous incredible destinations to hike, but the best is the trail to both Lower and Upper Jade Lakes. While just five miles round trip, this trail allows you access into the pristine wilderness of the Absaroka high country. The route can be extended to bag two more stunning lakes—Upper Brooks and Rainbow Lakes— before topping out at Bear Cub Pass. The region gets more remote with every passing mile and grows in beauty just as fast. Especially today, you’ll want to get an early start, so stop in at any of the aforementioned spots to get caffeinated and full for the spectacular, two-hour drive to Yellowstone National Park. If you haven’t come this way before, the smooth drive across historic Togwotee Pass offers unforgettable views of broad mountain meadows and pine forests. Keep your eyes open for wildlife before you even reach the park. Since you will be arriving from the south, your first stop should be at Lake Village, where you can explore Yellowstone Lake and the old lodge that rests on its shores. From there, drive through the bison-filled Hayden Valley before exploring the majesty of the Grand Canyon of Yellowstone and Yellowstone Falls. 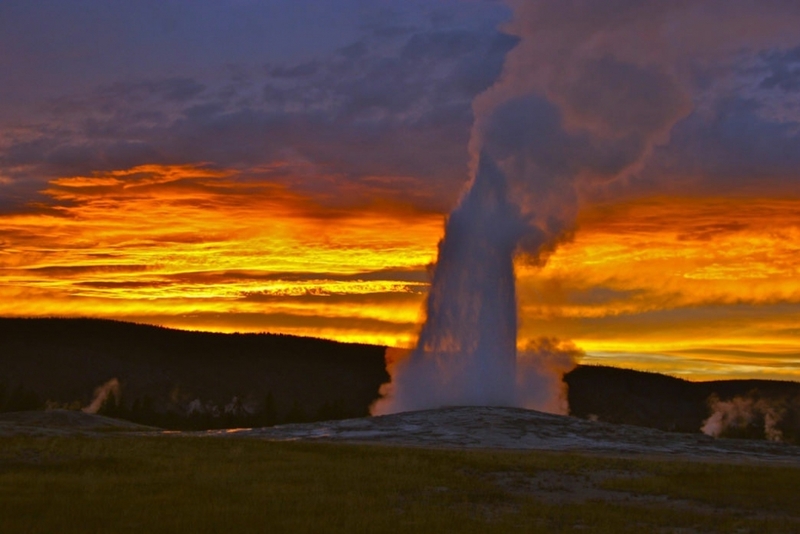 After being awestruck, head toward Norris and explore the numerous and iconic Geyser Basins along the road before ending your day at Old Faithful. If you want something a bit more extreme in Yellowstone, wake up early and drive through the park to tackle two iconic trails. The first is hiking to the top of Mount Washburn from the Grand Canyon side of the road. The trail is steep, but beautiful, and has views of the park and maybe even a wildlife encounter. If time allows, continue heading up toward the northeast entrance and hike the Specimen Ridge Trail at the start of the Lamar Valley. This trail is epic, and offers sweeping views, endless animal sightings, and a level of remoteness not found in this normally crowded park. After all day hiking, you have surely worked up an appetite, and as it’s your last day in Dubois, why not splurge on a special meal? The Wilderness Boundary Restaurant at Lava Mountain Lodge, just east of the Brooks Lake Road turnoff is the ideal spot to spoil yourself on your way home from Yellowstone. Their menu covers the gamut from nachos and pizza to elk burgers and prime rib. The food is guaranteed to hit the spot after a long day on the trails. Originally written by RootsRated for Dubois Chamber of Commerce.